Drop either tablet into an included Smart Dock and you have an Amazon Alexa display. Lenovo’s Smart Tab M10 and P10 are ready to branch out from their humdrum Android tablet lives. Maybe you’ll employ them a few hours a day as a tablet. 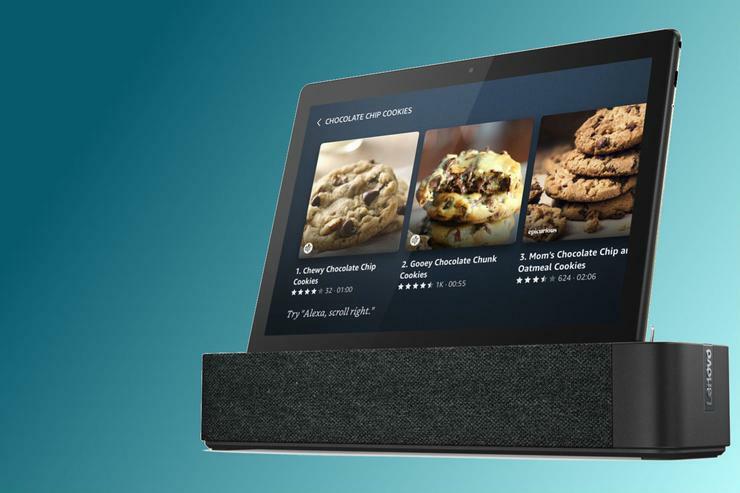 But if you pair them with their included Smart Docks, they become Amazon Alexa-powered smart displays, expanding their usefulness around your home. The Smart Dock also acts as an auxiliary speaker for its connected tablet, offering better sound than you’d get from the tablet alone. The tablets themselves have front-firing speakers with Dolby Atmos technology, but they can’t compete with a fuller-fledged speaker such as the Smart Dock provides. Announced at CES and due to ship in January, the M10 and P10 will cost $200 and $250, respectively. The more expensive P10 is actually a little smaller in size compared to the M10, but it offers some better specs: a larger battery, plus a glass back for a classier look. The Smart Dock, the same for either unit, offers two 3-watt speakers and three far-field microphones. It measures 2.57 x 11.16 x 1.96 inches and weighs 1.76 pounds. The tablet nests easily into the dock using pogo pins. The Smart Dock also acts as a charger for the tablet.